Do you remember this little cutie? Well, look at her big sisters! I had the white bucket and I purchased the orange one from...you know where. 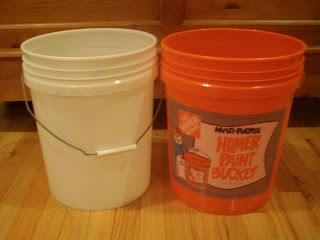 They are both 5 gallons and the orange bucket was only $2.78 and a cover was 98 cents if you needed one. Here's one sister all dressed up and ready to go to a quilt retreat, sewing class or a friend's house to sew. I had this blue canvas insert from my dad. It slips over the bucket and has a ton of pockets both outside (all around) and inside (all around). This is what she wants to be when she grows up!! 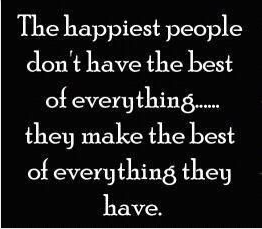 and on the inside, fabric, rulers, freezer paper, your large iron...and so much more!! 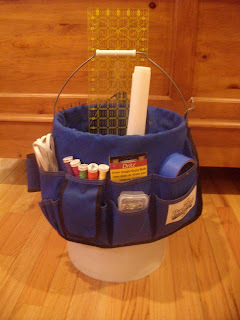 This bucket is very handy and will organize so much...all you'll have to carry to class is the bucket and your machine. 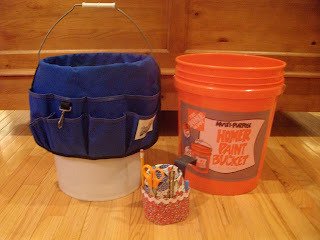 I'm sure you can think of so much more to put in your own bucket, especially for different crafts. The inserts come in many sizes and colors from different hardware stores, so go take a look at your local store and see what they have. You can also look on line. I found this one on the Home Depot site for only $9.97. I haven't seen this one in person, so I'm not sure of the pockets. I hope this helps keep all of your things in one place when you're traveling. 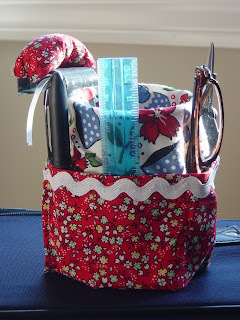 This is also great for all of the quilters out there who have to put their supplies away each time, because they're sewing on the kitchen table!! Just load this up and you can carry it from room to room. 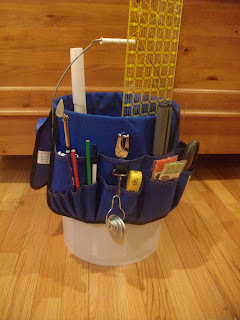 wanted to add one more thing I just thought of...last week's TTT, the portable quilt frame, would store nicely in this bucket too, once you take it apart. Great idea! 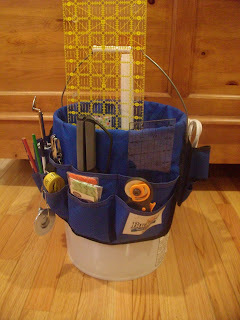 I've helped my husband with those types of bucket organizers, but never thought to do it for myself! 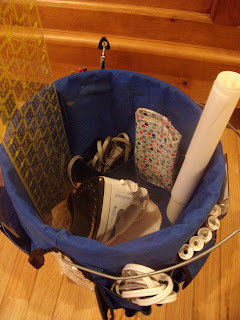 Another terrific idea...and when I saw the iron inside the bucket...I was sold...I always have the hardest time carting my iron around to classes and retreats...I never know how to store/carry it...the bucket is perfect...especially since so many other things can go in as well! What a useful family these holders are! You are amazing, always so many ideas and finds. Thanks for sharing! I love my car caddy and this next one looks great too. 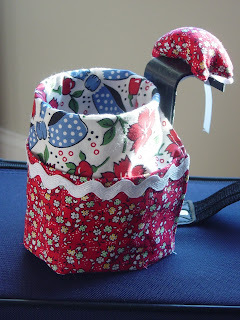 There is actually a pattern out there somewhere on the web to make the pockets, in your choice of fabrics, for you big bucket. I just love this idead! Fantastic idea...especially for ending the day with that hot iron! I always look forward to Tuesdays now. Thanks. This is just so much fun! Such good ideas for tool storage! Your ideas are just great. 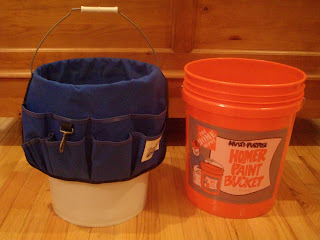 I am traveling later this week and will be sure to stop by Home Depot/Lowes and pick up a bucket and insert. Keep 'em coming. Just found your blog some great ideas here. Great job. I love this idea! Great for any type of sewing get togethers. Hey maybe even for scrap bookers! This is another amazing project and would be great to take along to a quilt class or retreat, not to mention a great gift for quilty friends. Way to go!!! Oh, having been away from my blogging buddies for the past few weeks, I was cheered knowing that I would be seeing what you had been doing for "tool time tuesdays" and I have not been disappointed. Too funny Karen and you must wake up on the run when you come up with these crazy useful ideas! You rock Girl! Passei o dia aprendendo todas as idéias maravilhosas que você nos passa. Com certeza vou usar muita coisa na minha casa.